Hemodialysis, also spelled haemodialysis, commonly called kidney dialysis or simply dialysis, is a process of purifying the blood of a person whose kidneys are not working normally. It is a method that is used to achieve the extracorporeal removal of waste products such as creatinine and urea and free water from the blood when the kidneys are in a state of renal failure. Hemodialysis is one of three renal replacement therapies (the other two being renal transplant and peritoneal dialysis). An alternative method for extracorporeal separation of blood components such as plasma or cells is apheresis. The principle of hemodialysis is the same as other methods of dialysis; it involves diffusion of solutes across a semipermeable membrane. Hemodialysis utilizes counter current flow, where the dialysate is flowing in the opposite direction to blood flow in the extracorporeal circuit. Counter-current flow maintains the concentration gradient across the membrane at a maximum and increases the efficiency of the dialysis. Fluid removal (ultrafiltration) is achieved by altering the hydrostatic pressure of the dialysate compartment, causing free water and some dissolved solutes to move across the membrane along a created pressure gradient. The dialysis solution that is used may be a sterilized solution of mineral ions or comply with British Pharmacopoeia. Urea and other waste products, potassium, and phosphate diffuse into the dialysis solution. However, concentrations of sodium and chloride are similar to those of normal plasma to prevent loss. Sodium bicarbonate is added in a higher concentration than plasma to correct blood acidity. A small amount of glucose is also commonly used. Note that this is a different process to the related technique of hemofiltration. Many have played a role in developing dialysis as a practical treatment for renal failure, starting with Thomas Hass (February 28, 1924) and the artificial kidney was developed into a clinically useful apparatus by Kolff in 1943 - 1945. This research showed that life could be prolonged in patients dying of renal failure. Peter Bent Brigham Hospital in Boston. This led to the manufacture of the next generation of Kolff's dialyzer, a stainless steel Kolff-Brigham dialysis machine. According to McKellar (1999), a significant contribution to renal therapies was made by Canadian surgeon Gordon Murray with the assistance of two doctors, an undergraduate chemistry student, and research staff. Murray's work was conducted simultaneously and independently from that of Kolff. Murray's work led to the first successful artificial kidney built in North America in 1945–46, which was successfully used to treat a 26-year-old woman out of a uraemic coma in Toronto. The less-crude, more compact, second-generation "Murray-Roschlau" dialyser was invented in 1952–53, whose designs were stolen by German immigrant Erwin Halstrup, and passed off as his own (the "Halstrup–Baumann artificial kidney"). By the 1950s, Willem Kolff's invention of the dialyzer was used for acute renal failure, but it was not seen as a viable treatment for patients with stage 5 chronic kidney disease (CKD). At the time, doctors believed it was impossible for patients to have dialysis indefinitely for two reasons. First, they thought no man-made device could replace the function of kidneys over the long term. In addition, a patient undergoing dialysis suffered from damaged veins and arteries, so that after several treatments, it became difficult to find a vessel to access the patient's blood. The original Kolff kidney was not very useful clinically, because it did not allow for removal of excess fluid. Swedish professor Nils Alwall encased a modified version of this kidney inside a stainless steel canister, to which a negative pressure could be applied, in this way effecting the first truly practical application of hemodialysis, which was done in 1946 at the University of Lund. Alwall also was arguably the inventor of the arteriovenous shunt for dialysis. He reported this first in 1948 where he used such an arteriovenous shunt in rabbits. Subsequently he used such shunts, made of glass, as well as his canister-enclosed dialyzer, to treat 1500 patients in renal failure between 1946 and 1960, as reported to the First International Congress of Nephrology held in Evian in September 1960. Alwall was appointed to a newly created Chair of Nephrology at the University of Lund in 1957. Subsequently, he collaborated with Swedish businessman Holger Crafoord to found one of the key companies that would manufacture dialysis equipment in the past 50 years, Gambro. The early history of dialysis has been reviewed by Stanley Shaldon. Belding H. Scribner, working with the surgeon Wayne Quinton, modified the glass shunts used by Alwall by making them from Teflon. Another key improvement was to connect them to a short piece of silicone elastomer tubing. This formed the basis of the so-called Scribner shunt, perhaps more properly called the Quinton-Scribner shunt. After treatment, the circulatory access would be kept open by connecting the two tubes outside the body using a small U-shaped Teflon tube, which would shunt the blood from the tube in the artery back to the tube in the vein. In 1962, Scribner started the world's first outpatient dialysis facility, the Seattle Artificial Kidney Center, later renamed the Northwest Kidney Centers. Immediately the problem arose of who should be given dialysis, since demand far exceeded the capacity of the six dialysis machines at the center. Scribner decided that he would not make the decision about who would receive dialysis and who would not. Instead, the choices would be made by an anonymous committee, which could be viewed as one of the first bioethics committees. For a detailed history of successful and unsuccessful attempts at dialysis, including pioneers such as Abel and Roundtree, Haas, and Necheles, see this review by Kjellstrand. A prescription for dialysis by a nephrologist (a medical kidney specialist) will specify various parameters for a dialysis treatment. These include frequency (how many treatments per week), length of each treatment, and the blood and dialysis solution flow rates, as well as the size of the dialyzer. The composition of the dialysis solution is also sometimes adjusted in terms of its sodium and potassium and bicarbonate levels. In general, the larger the body size of an individual, the more dialysis he/she will need. In North America and the UK, 3-4 hour treatments (sometimes up to 5 hours for larger patients) given 3 times a week are typical. Twice-a-week sessions are limited to patients who have a substantial residual kidney function. Four sessions per week are often prescribed for larger patients, as well as patients who have trouble with fluid overload. Finally, there is growing interest in short daily home hemodialysis, which is 1.5 - 4 hr sessions given 5-7 times per week, usually at home. There is also interest in nocturnal dialysis, which involves dialyzing a patient, usually at home, for 8–10 hours per night, 3-6 nights per week. Nocturnal in-center dialysis, 3-4 times per week, is also offered at a handful of dialysis units in the United States. Hemodialysis often involves fluid removal (through ultrafiltration), because most patients with renal failure pass little or no urine. Side effects caused by removing too much fluid and/or removing fluid too rapidly include low blood pressure, fatigue, chest pains, leg-cramps, nausea and headaches. These symptoms can occur during the treatment and can persist post treatment; they are sometimes collectively referred to as the dialysis hangover or dialysis washout. The severity of these symptoms is usually proportionate to the amount and speed of fluid removal. However, the impact of a given amount or rate of fluid removal can vary greatly from person to person and day to day. These side effects can be avoided and/or their severity lessened by limiting fluid intake between treatments or increasing the dose of dialysis e.g. dialyzing more often or longer per treatment than the standard three times a week, 3–4 hours per treatment schedule. Since hemodialysis requires access to the circulatory system, patients undergoing hemodialysis may expose their circulatory system to microbes, which can lead to sepsis, an infection affecting the heart valves (endocarditis) or an infection affecting the bones (osteomyelitis). The risk of infection varies depending on the type of access used (see below). Bleeding may also occur, again the risk varies depending on the type of access used. Infections can be minimized by strictly adhering to infection control best practices. Heparin is the most commonly used anticoagulant in hemodialysis, as it is generally well tolerated and can be quickly reversed with protamine sulfate. Heparin allergy can infrequently be a problem and can cause a low platelet count. In such patients, alternative anticoagulants can be used. In patients at high risk of bleeding, dialysis can be done without anticoagulation. First Use Syndrome is a rare but severe anaphylactic reaction to the artificial kidney. Its symptoms include sneezing, wheezing, shortness of breath, back pain, chest pain, or sudden death. It can be caused by residual sterilant in the artificial kidney or the material of the membrane itself. In recent years, the incidence of First Use Syndrome has decreased, due to an increased use of gamma irradiation, steam sterilization, or electron-beam radiation instead of chemical sterilants, and the development of new semipermeable membranes of higher biocompatibility. New methods of processing previously acceptable components of dialysis must always be considered. For example, in 2008, a series of first-use type of reactions, including deaths, occurred due to heparin contaminated during the manufacturing process with oversulfated chondroitin sulfate. Longterm complications of hemodialysis include amyloidosis, neuropathy and various forms of heart disease. Increasing the frequency and length of treatments have been shown to improve fluid overload and enlargement of the heart that is commonly seen in such patients. Due to these complications, the prevalence of complementary and alternative medicine use is high among patients undergoing hemodialysis. Listed below are specific complications associated with different types of hemodialysis access. In hemodialysis, three primary methods are used to gain access to the blood: an intravenous catheter, an arteriovenous fistula (AV) or a synthetic graft. The type of access is influenced by factors such as the expected time course of a patient's renal failure and the condition of his or her vasculature. Patients may have multiple accesses, usually because an AV fistula or graft is maturing and a catheter is still being used. The creation of all these three major types of vascular accesses requires surgery. Catheter access, sometimes called a CVC (central venous catheter), consists of a plastic catheter with two lumens (or occasionally two separate catheters) which is inserted into a large vein (usually the vena cava, via the internal jugular vein or the femoral vein) to allow large flows of blood to be withdrawn from one lumen, to enter the dialysis circuit, and to be returned via the other lumen. However, blood flow is almost always less than that of a well functioning fistula or graft. Catheters are usually found in two general varieties, tunnelled and non-tunnelled. Non-tunnelled catheter access is for short-term access (up to about 10 days, but often for one dialysis session only), and the catheter emerges from the skin at the site of entry into the vein. Tunnelled catheter access involves a longer catheter, which is tunnelled under the skin from the point of insertion in the vein to an exit site some distance away. It is usually placed in the internal jugular vein in the neck and the exit site is usually on the chest wall. The tunnel acts as a barrier to invading microbes, and as such, tunnelled catheters are designed for short- to medium-term access (weeks to months only), because infection is still a frequent problem. Aside from infection, venous stenosis is another serious problem with catheter access. The catheter is a foreign body in the vein and often provokes an inflammatory reaction in the vein wall. This results in scarring and narrowing of the vein, often to the point of occlusion. This can cause problems with severe venous congestion in the area drained by the vein and may also render the vein, and the veins drained by it, useless for creating a fistula or graft at a later date. Patients on long-term hemodialysis can literally 'run out' of access, so this can be a fatal problem. 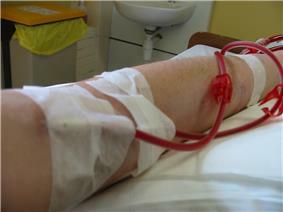 Catheter access is usually used for rapid access for immediate dialysis, for tunnelled access in patients who are deemed likely to recover from acute renal failure, and for patients with end-stage renal failure who are either waiting for alternative access to mature or who are unable to have alternative access. Catheter access is often popular with patients, because attachment to the dialysis machine doesn't require needles. However, the serious risks of catheter access noted above mean that such access should be contemplated only as a long-term solution in the most desperate access situation. AV (arteriovenous) fistulas are recognized as the preferred access method. To create a fistula, a vascular surgeon joins an artery and a vein together through anastomosis. Since this bypasses the capillaries, blood flows rapidly through the fistula. One can feel this by placing one's finger over a mature fistula. This is called feeling for "thrill" and produces a distinct 'buzzing' feeling over the fistula. One can also listen through a stethoscope for the sound of the blood "whooshing" through the fistula, a sound called bruit. Fistulas are usually created in the nondominant arm and may be situated on the hand (the 'snuffbox' fistula'), the forearm (usually a radiocephalic fistula, or so-called Brescia-Cimino fistula, in which the radial artery is anastomosed to the cephalic vein), or the elbow (usually a brachiocephalic fistula, where the brachial artery is anastomosed to the cephalic vein). Though less common, fistulas can also be created in the groin, though the creation process differs. Placement in the groin is usually done when options in the arm and hands are not available due to anatomy or the failure of fistulas previously created in the arms/hands. A fistula will take a number of weeks to mature, on average perhaps 4–6 weeks. During treatment, two needles are inserted into the fistula, one to draw blood and one to return it. The orientation of the needles takes the normal flow of the blood into account. The "arterial" needle draws blood from the "upstream" location while the "venous" needle returns blood "downstream". Switching this order leads to partial recycling of the same blood through the dialysis machine leading to less effective treatment. The advantages of the AV fistula use are lower infection rates, because no foreign material is involved in their formation, higher blood flow rates (which translates to more effective dialysis), and a lower incidence of thrombosis. The complications are fewer than with other access methods. If a fistula has a very high blood flow and the vasculature that supplies the rest of the limb is poor, a steal syndrome can occur, where blood entering the limb is drawn into the fistula and returned to the general circulation without entering the limb's capillaries. This results in cold extremities of that limb, cramping pains, and, if severe, tissue damage. One long-term complication of an AV fistula can be the development of an aneurysm, a bulging in the wall of the vein where it is weakened by the repeated insertion of needles over time. To a large extent the risk of developing an aneurysm can be reduced by carefully rotating needle sites over the entire fistula, or using the "buttonhole" (constant site) technique. Aneurysms may necessitate corrective surgery and may shorten the useful life of a fistula. Fistulas can also become blocked due to blood clotting or infected if sterile precautions are not followed during needle insertion at the start of dialysis. Because of the high volume of blood flowing through the fistula, excessive bleeding can also occur. This is most common soon after a dialysis treatment. Pressure must be applied to the needle holes to induce clotting. If that pressure is removed prematurely or a patient engages in physical activity too soon after dialysis, the needle holes can open up. To prevent damage to the fistula and aneurysm or pseudoaneurysm formation, it is recommended that the needle be inserted at different points in a rotating fashion. Another approach is to cannulate the fistula with a blunted needle, in exactly the same place. This is called a 'buttonhole' approach. Often two or three buttonhole places are available on a given fistula. This also can prolong fistula life and help prevent damage to the fistula. AV (arteriovenous) grafts are much like fistulas in most respects, except that an artificial vessel is used to join the artery and vein. The graft usually is made of a synthetic material, often PTFE, but sometimes chemically treated, sterilized veins from animals are used. Grafts are inserted when the patient's native vasculature does not permit a fistula. They mature faster than fistulas, and may be ready for use several weeks after formation (some newer grafts may be used even sooner). However, AV grafts are at high risk to develop narrowing, especially in the vein just downstream from where the graft has been sewn to the vein. Narrowing often leads to thrombosis (clotting). As foreign material, they are at greater risk for becoming infected. More options for sites to place a graft are available, because the graft can be made quite long. Thus a graft can be placed in the thigh or even the neck (the 'necklace graft'). AV fistulas have a much better access patency and survival than do venous catheters or grafts. They also produce better patient survival and have far fewer complications compared to grafts or venous catheters. For this reason, the Centers for Medicare & Medicaid (CMS) has set up a Fistula First Initiative, whose goal is to increase the use of AV fistulas in dialysis patients. There is ongoing research to make bio-engineered blood vessels, which may be of immense importance in creating AV fistulas for patients on hemodialysis, who do not have good blood vessels for creation of one. It involves growing cells which produce collagen and other proteins on a biodegradable micromesh tube followed by removal of those cells to make the 'blood vessels' storable in refrigerators. There are three types of hemodialysis: conventional hemodialysis, daily hemodialysis, and nocturnal hemodialysis. Below is an adaptation and summary from a brochure of The Ottawa Hospital. Conventional hemodialysis is usually done three times per week, for about 3–4 hours for each treatment, during which the patient's blood is drawn out through a tube at a rate of 200-400 mL/min. The tube is connected to a 15, 16, or 17 gauge needle inserted in the dialysis fistula or graft, or connected to one port of a dialysis catheter. 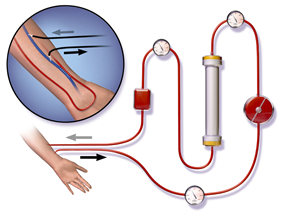 The blood is then pumped through the dialyzer, and then the processed blood is pumped back into the patient's bloodstream through another tube (connected to a second needle or port). During the procedure, the patient's blood pressure is closely monitored, and if it becomes low, or the patient develops any other signs of low blood volume such as nausea, the dialysis attendant can administer extra fluid through the machine. During the treatment, the patient's entire blood volume (about 5000 cc) circulates through the machine every 15 minutes. During this process, the dialysis patient is exposed to a week's worth of water for the average person. Daily hemodialysis is typically used by those patients who do their own dialysis at home. It is less stressful (more gentle) but does require more frequent access. This is simple with catheters, but more problematic with fistulas or grafts. The "buttonhole technique" can be used for fistulas requiring frequent access. Daily hemodialysis is usually done for 2 hours six days a week. The procedure of nocturnal hemodialysis is similar to conventional hemodialysis except it is performed three to six nights a week and between six and ten hours per session while the patient sleeps. 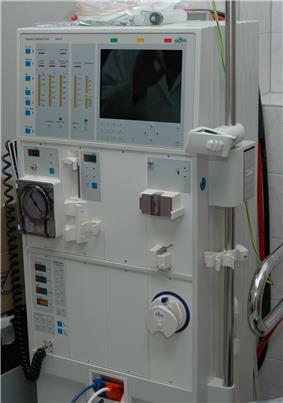 The hemodialysis machine pumps the patient's blood and the dialysate through the dialyzer. The newest dialysis machines on the market are highly computerized and continuously monitor an array of safety-critical parameters, including blood and dialysate flow rates; dialysis solution conductivity, temperature, and pH; and analysis of the dialysate for evidence of blood leakage or presence of air. Any reading that is out of normal range triggers an audible alarm to alert the patient-care technician who is monitoring the patient. Manufacturers of dialysis machines include companies such as Nipro, Fresenius, Gambro, Baxter, B. Braun, NxStage and Bellco. For this reason, water used in hemodialysis is carefully purified before use. Initially it is filtered and temperature-adjusted and its pH is corrected by adding an acid or base. Then it is softened. Next the water is run through a tank containing activated charcoal to reverse osmosis membrane. This lets the water pass, but holds back even very small solutes such as electrolytes. Final removal of leftover electrolytes is done by passing the water through a tank with ion-exchange resins, which remove any leftover anions or cations and replace them with hydroxyl and hydrogen ions, respectively, leaving ultrapure water. The dialyzer is the piece of equipment that actually filters the blood. Almost all dialyzers in use today are of the hollow-fiber variety. A cylindrical bundle of hollow fibers, whose walls are composed of semi-permeable membrane, is anchored at each end into potting compound (a sort of glue). This assembly is then put into a clear plastic cylindrical shell with four openings. One opening or blood port at each end of the cylinder communicates with each end of the bundle of hollow fibers. This forms the "blood compartment" of the dialyzer. Two other ports are cut into the side of the cylinder. These communicate with the space around the hollow fibers, the "dialysate compartment." Blood is pumped via the blood ports through this bundle of very thin capillary-like tubes, and the dialysate is pumped through the space surrounding the fibers. Pressure gradients are applied when necessary to move fluid from the blood to the dialysate compartment. Dialyzer membranes come with different pore sizes. Those with smaller pore size are called "low-flux" and those with larger pore sizes are called "high-flux." Some larger molecules, such as beta-2-microglobulin, are not removed at all with low-flux dialyzers; lately, the trend has been to use high-flux dialyzers. However, such dialyzers require newer dialysis machines and high-quality dialysis solution to control the rate of fluid removal properly and to prevent backflow of dialysis solution impurities into the patient through the membrane. Dialyzer membranes used to be made primarily of cellulose (derived from cotton linter). The surface of such membranes was not very biocompatible, because exposed hydroxyl groups would activate complement in the blood passing by the membrane. Therefore, the basic, "unsubstituted" cellulose membrane was modified. One change was to cover these hydroxyl groups with acetate groups (cellulose acetate); another was to mix in some compounds that would inhibit complement activation at the membrane surface (modified cellulose). The original "unsubstituted cellulose" membranes are no longer in wide use, whereas cellulose acetate and modified cellulose dialyzers are still used. Cellulosic membranes can be made in either low-flux or high-flux configuration, depending on their pore size. Another group of membranes is made from synthetic materials, using polymers such as polyarylethersulfone, polyamide, polyvinylpyrrolidone, polycarbonate, and polyacrylonitrile. These synthetic membranes activate complement to a lesser degree than unsubstituted cellulose membranes. Synthetic membranes can be made in either low- or high-flux configuration, but most are high-flux. Nanotechnology is being used in some of the most recent high-flux membranes to create a uniform pore size. The goal of high-flux membranes is to pass relatively large molecules such as beta-2-microglobulin (MW 11,600 daltons), but not to pass albumin (MW ~66,400 daltons). Every membrane has pores in a range of sizes. As pore size increases, some high-flux dialyzers begin to let albumin pass out of the blood into the dialysate. This is thought to be undesirable, although one school of thought holds that removing some albumin may be beneficial in terms of removing protein-bound uremic toxins. Whether using a high-flux dialyzer improves patient outcomes is somewhat controversial, but several important studies have suggested that it has clinical benefits. The NIH-funded HEMO trial compared survival and hospitalizations in patients randomized to dialysis with either low-flux or high-flux membranes. Although the primary outcome (all-cause mortality) did not reach statistical significance in the group randomized to use high-flux membranes, several secondary outcomes were better in the high-flux group. A recent Cochrane analysis concluded that benefit of membrane choice on outcomes has not yet been demonstrated. A collaborative randomized trial from Europe, the MPO (Membrane Permeabilities Outcomes) study, comparing mortality in patients just starting dialysis using either high-flux or low-flux membranes, found a nonsignificant trend to improved survival in those using high-flux membranes, and a survival benefit in patients with lower serum albumin levels or in diabetics. High-flux dialysis membranes and/or intermittent on-line hemodiafiltration (IHDF) may also be beneficial in reducing complications of beta-2-microglobulin accumulation. Because beta-2-microglobulin is a large molecule, with a molecular weight of about 11,600 daltons, it does not pass at all through low-flux dialysis membranes. Beta-2-M is removed with high-flux dialysis, but is removed even more efficiently with IHDF. After several years (usually at least 5-7), patients on hemodialysis begin to develop complications from beta-2-M accumulation, including carpal tunnel syndrome, bone cysts, and deposits of this amyloid in joints and other tissues. Beta-2-M amyloidosis can cause very serious complications, including spondyloarthropathy, and often is associated with shoulder joint problems. Observational studies from Europe and Japan have suggested that using high-flux membranes in dialysis mode, or IHDF, reduces beta-2-M complications in comparison to regular dialysis using a low-flux membrane. Dialyzers come in many different sizes. A larger dialyzer with a larger membrane area (A) will usually remove more solutes than a smaller dialyzer, especially at high blood flow rates. This also depends on the membrane permeability coefficient K0 for the solute in question. So dialyzer efficiency is usually expressed as the K0A - the product of permeability coefficient and area. Most dialyzers have membrane surface areas of 0.8 to 2.2 square meters, and values of K0A ranging from about 500 to 1500 mL/min. K0A, expressed in mL/min, can be thought of as the maximum clearance of a dialyzer at very high blood and dialysate flow rates. The dialyzer may either be discarded after each treatment or be reused. Reuse requires an extensive procedure of high-level disinfection. Reused dialyzers are not shared between patients. There was an initial controversy about whether reusing dialyzers worsened patient outcomes. The consensus today is that reuse of dialyzers, if done carefully and properly, produces similar outcomes to single use of dialyzers. Dialyzer Reuse is a practice that has been around since the invention of the product. This practice includes the cleaning of a used dialyzer to be reused multiple times for the same patient. Dialysis clinics reuse dialyzers to become more economical and reduce the high costs of “single-use” dialysis which can be extremely expensive and wasteful. Single used dialyzers are initiated just once and then thrown out creating a large amount of bio-medical waste with no mercy for cost savings. If done right, dialyzer reuse can be very safe for dialysis patients. There are two ways of reusing dialyzers, manual and automated. Manual reuse involves the cleaning of a dialyzer by hand. The dialyzer is semi-disassembled then flushed repeatedly before being rinsed with water. It is then stored with a liquid disinfectant(PAA) for 18+ hours until its next use. Although many clinics outside the USA use this method, some clinics are switching toward a more automated/streamlined process as the dialysis practice advances. The newer method of automated reuse is achieved by means of a medical device which began in the early 1980s. These devices are beneficial to dialysis clinics that practice reuse – especially for large dialysis clinical entities – because they allow for several back to back cycles per day. The dialyzer is first pre-cleaned by a technician, then automatically cleaned by machine through a step-cycles process until it is eventually filled with liquid disinfectant for storage. Although automated reuse is more effective than manual reuse, newer technology has sparked even more advancement in the process of reuse. When reused over 15 times with current methodology, the dialyzer can lose B2m, middle molecule clearance and fiber pore structure integrity, which has the potential to reduce the effectiveness of the patient's dialysis session. Currently, as of 2010, newer, more advanced reprocessing technology has proven the ability to completely eliminate the manual pre-cleaning process altogether and has also proven the potential to regenerate(fully restore) all functions of a dialyzer to levels that are approximately equivalent to single-use for more than 40 cycles. As medical reimbursement rates begin to fall even more, many dialysis clinics are continuing to operate effectively with reuse programs especially since the process is easier and more streamlined than before. Hemodialysis Vascular Access: Assess the fistula/graft and arm before, after each dialysis or every shift: the access flow, complications Assess the complication of central venous catheter: the tip placement, exit site, complications document and notify appropriate health care provider regarding any concerns. educates the patient with appropriate cleaning of fistula/graft and exit site; with recognizing and reporting signs and symptoms of infection and complication. Hemodialysis adequacy: Assesses patient constantly for signs and symptoms of inadequate dialysis. Assesses possible causes of inadequate dialysis. Educates the patient on the importance of receiving adequate dialysis. Hemodialysis treatment and complications: Performs head to toe physical assessment before, during and after hemodialysis regarding complications and access's security. Confirm and deliver dialysis prescription after review most update lab results. Address any concerns of the patient and educate patient when recognizing the learning gap. Hemodialysis was one of the most common procedures performed in U.S. hospitals in 2011, occurring in 909,000 stays (a rate of 29 stays per 10,000 population). This was an increase of 68 percent from 1997, when there were 473,000 stays. It was the fifth most common procedure for patients aged 45–64 years. ^ Graham T. The Bakerian lecture: on osmotic force. Philosophical Transactions of the Royal Society in London. 1854;144:177–228. ^ Abel, J. J., Rountree, L. G., and Turner, B. B. The removal of diffusible substances from the circulating blood by means of dialysis. Tn. Assoc. Am. Phys., 28:51, 1913. ^ Kolff, W. J., and Berk, H. T. J. Artificial kidney, dialyzer with great area. Geneesk. gids., 21:1944. ^ University of Lund website: Nils Alwall. ^ Kjellstrand CM. 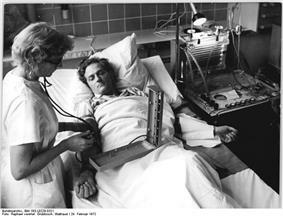 History of Dialysis, Men and Ideas. Talk given to the Nordic Nephrology Days Symposium, Lund, 1997, as archived on HDCN. ^ Kallenbach J.Z.In: Review of hemodialysis for nurses and dialysis personnel. 7th ed. St. Louis, Missouri:Elsevier Mosby; 2005. ^ a b Daugirdas J. T., Black P.G., Ing T.S. In "Handbook of Dialysis". 4th ed. Philadelphia, PA:Lippincott Williams & Wilkins, a Wolters Kluwer Business; 2007. ^ KDOQI Clinical Practice Guidelines for Hemodialysis Adequacy, 2006 Updates. CPR 5. ^ Canadian Association of Nephrology Nurses and Technologists. (2008). Canadian Association of Nephrology Nurses and Technologist Nephrology Nursing Standards and Practice Recommendations. Retrieved from http://www.cannt.ca/en//files/CANNT_Nursing_Standards_2008.pdf. Your Kidneys and How They Work - (American) National Institute of Diabetes and Digestive and Kidney Diseases (NIDDK), NIH. Treatment Methods for Kidney Failure - (American) National Institute of Diabetes and Digestive and Kidney Diseases (NIDDK), NIH. Treatment Methods for Kidney Failure: Hemodialysis - (American) National Kidney and Urologic Diseases Information Clearinghouse, NIH. ARCH Project - European research project for development of a model to simulate hemodynamic changes induced by AVF surgery and long-term adaptation.